This image was chosen as the APOD (Astronomy Picture of the Day) for March 15, 2007, click here to see the archived APOD. 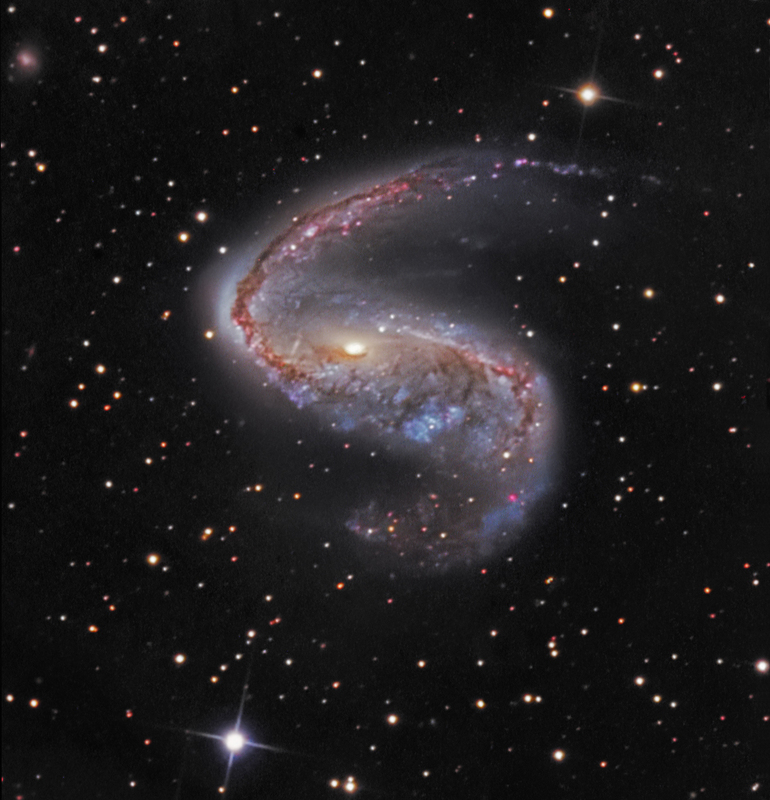 NGC2442 is a barred (SBbc) spiral galaxy in Volans with a visual magnitude of 10.4 at Right Ascension (2000.0): 07:36:19.0 and Declination (2000.0): -69:31:30. It is approximately 5x6 arcminute. In this image, North is toward the upper left, East is to the lower left The field is approx. 10 x 10 arcmin. It is thought that the distorted structure of NGC2442 arose from an interaction with a dwarf galaxy in the same group. Star forming regions are prevalent throughout the arms, but are concentrated in the northern spiral arm and tend to avoid the bar. The nucleus is rapidly rotating. This galaxy is not experiencing strong starburst. This galaxy was a commissioning target of the Spitzer Space Telescope.